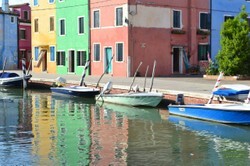 One of the most charming islands in the Venetian lagoon is without a doubt the small island of Burano. Located in the Northern lagoon, near Torcello and connected to Mazzorbo by a footbridge, Burano is a delight and inspiration for photographers and artists with its uniquely bright painted homes. It is also home to a long tradition of elegant lace-making, an art and craft that today is sadly dying out due to the intensive labor involved. Burano is a wonderful place to spend some time while in Venice, for it is easy to explore by foot in a short period of time. However I suggest lingering to appreciate its color and beauty, and the special charm that descends here later in the day as the bulk of the tourist crowds depart. All images on this page are property of the author, Nicole Pellegrini. The island of Burano is believed to have been first settled in the 6th century, by people fleeing hostile invaders on the mainland. It has always been predominantly a fishing village and community—legend goes that the brightly colored homes are a remnant of that tradition, that the colors were useful to fisherman struggling to find their way home in bad weather and fog. Although the island quickly thrived after settlement, it was ruled by the more important, nearby settlement of Torcello (the "first Venice", if you will) and was not given the same privileges of nearby Murano, home of the glassmakers. However the island rose in importance beginning in the 15th century, when the women began making lace with needles and fine cotton thread. Their lace came into high demand throughout Europe before the trade began to dwindle in the 18th century. In 1872, a school of lacemaking opened on the island, reviving the industry for some decades. The intricate lacework could take seven different people to complete one piece, as each lacemaker specialized in a particular pattern or style. The lace school closed in 1970, however, and today is the site of the island's lace museum. Only a handful of women today still practice the traditional art of Burano lacemaking; you may observe some of them at work in the museum or in one of the island's best lace shops, La Perla Gallery. When you visit La Perla, you can see their collection of incredible modern and historic lace pieces. We purchased the two framed pieces shown above in 2016 on a visit to the island. With so few remaining today who can produce such art, we were actually encouraged that should we ever wish to re-sell our precious works to connect La Perla as they would offer to rebuy them first! Eleven years ago, on my first trip to Venice, I bought a lace dress at another shop on Burano, Artigianato del Merletto 'Da Rita', for a friend's wedding. It was delightful to come back to Burano this year and find the same lovely women running the shop today—and I found another beautiful dress to take home with me this time as well! The original dress I bought on Burano in 2007...still looking good today! There are a number of restaurants on Burano where you can sample the local cuisine—and of course seafood is the specialty! Perhaps the two most famous restaurants on the island are Trattoria da Romano (featured by Anthony Bourdain in an episode of "No Reservations") and Trattoria al Gatto Nero (visited by Andrew Zimmern on "Bizarre Foods" and Jamie Oliver on "Jamie Does Venice!"). At both restaurants you can taste the Burano specialty of Risotto di Gò, a very subtly-flavored risotto made from a stock of lagoon goby fish. You'll also want to grab an espresso and some freshly-baked bussolà or esse cookies, a sweet treat specialty of the island. Many shops sell bags you can bring home with you...and trust me, they are addictive! The main shopping streets of Burano can get quite busy mid-day. The easiest way to get to Burano is via the vaporetto water bus. The Number 12 will get you there from the Fondamente Nove dock in Venice in about 40 minutes. The boat runs frequently in both directions for most of the day, and every hour into the evening. I've noticed in the past that many tourists flood onto Burano around mid-day after spending their morning first on Murano shopping for glass. My suggestion? Go against the tide. If you have the full day, take the Number 12 past Burano to the island of Torcello first, which is extremely quiet and with two beautiful, ancient churches to visit (and is perhaps my favorite place in the entire lagoon). There are also several outstanding restaurants on Torcello to enjoy lunch before then heading over to Burano, which I find most enjoyable to visit in the later afternoon when most visitors are either moving on to a quick stop on Torcello or heading back to Venice. (Another possibility to consider, if you're looking for a real splurge, is to book a luncheon table at the Michelin-starred Venissa wine resort on connected Mazzorbo.) Stay as the shops are closing for the evening, grab a table at an outdoor cafe, and drink a Spritz while watching the island residents begin their evening passeggiata. It seems particularly charming here as the island is so small, you will see the same people stroll back and forth several times, greeting friends and neighbors, before heading home to make dinner. Care to join me on Burano? @dustytoes - it really is inspiring, in fact I'm sitting down today to work on a watercolor painting inspired by some of the photos I took. On our most recent visit we took the vaporetto back with an artist who had been working on a painting on-site for several days. Island of color is right! These beautiful houses make me want to get my sketchpad and draw. That lacework is stunning and I would enjoy seeing the work in person. It seems that this is a place you love to re-visit and no wonder, with the delicious food, shopping and sights. Your advice about avoiding crowds will be helpful to those planning a visit to Venice.